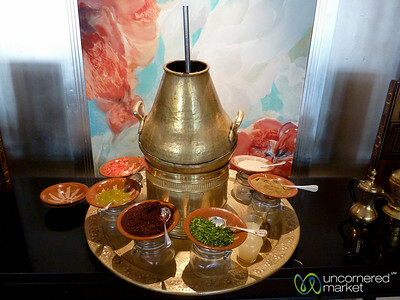 Arabic coffee is a mixture of ground cardamom and coffee together (which is why it looks light here). 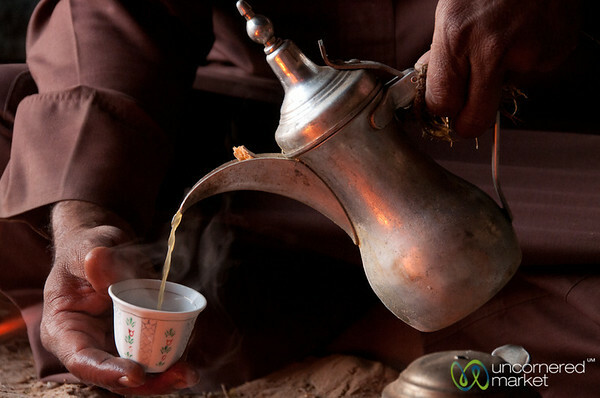 It is poured into small cups and has a specific tradition and process of when to drink and how much to drink and how to hold the cup. 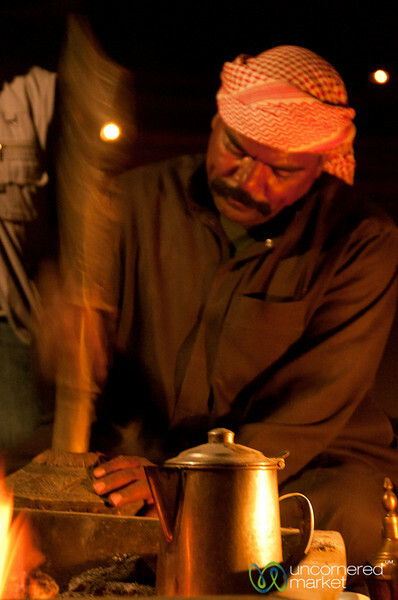 Taken in a Bedouin tent in Wadi Rum, Jordan. 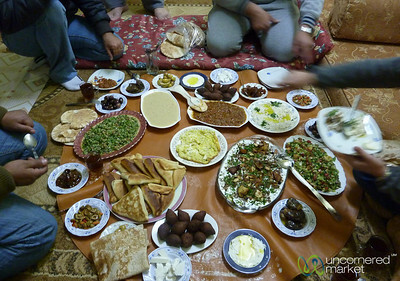 A large spread of mezze and other Druze food specialties served at a family home in Azraq, Jordan. 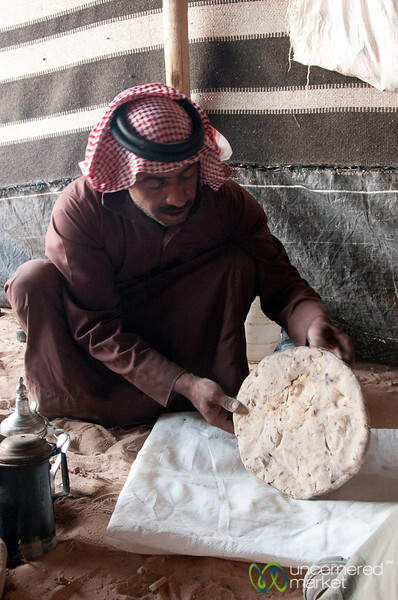 A large tray of mansaf, a traditional Jordanian dish made from goat cooked in a yogurt/sour milk sauce, is ready for eating at Dana Guest House in Jordan. 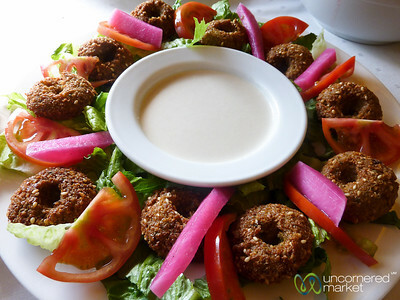 A tray of balls of falafel with pickled vegetables, tomatoes and tahini. 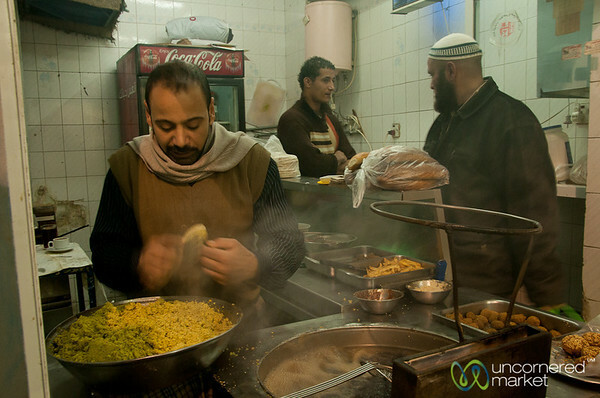 The falafel in Jordan was light and crispy. 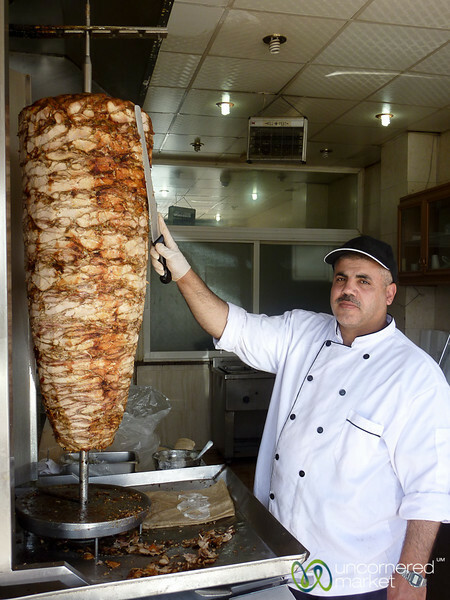 Stopping for lunch at a roadside place with awesome chicken shawarma sandwiches on the outskirts of Madaba in Jordan. 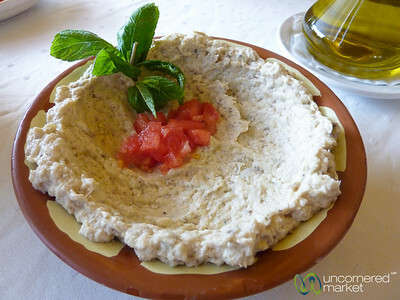 What is Lunch in Jordan Without Hummus? 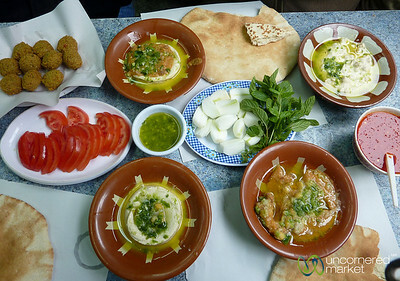 A typical mezze dish served at all meals of hummus. 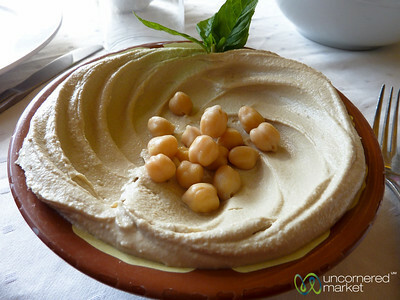 Made from blended chickpeas, tahini, oil, and lemon juice. 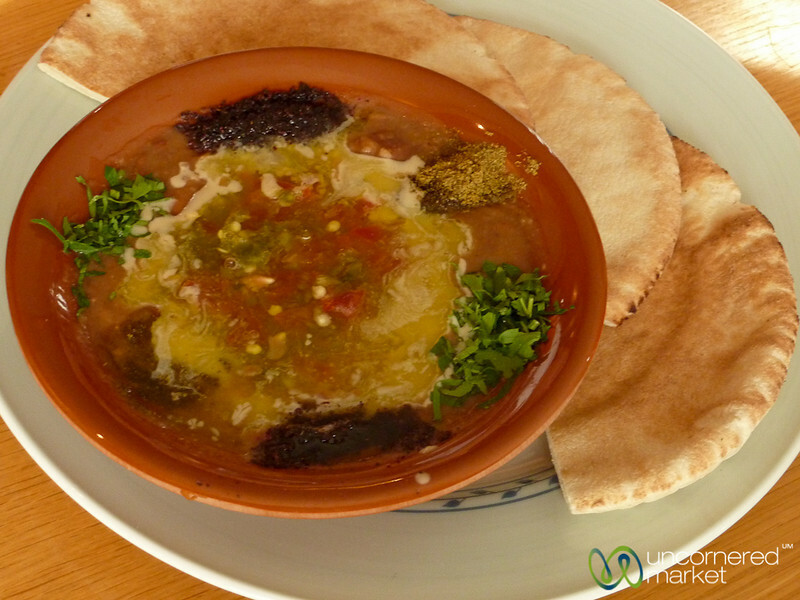 A typical mezze dish of moutabel is made from crushed roasted aubergine (eggplant) mixed with garlic, olive oil, lemon juice. Really delicous. Wiping the ashes away from the Beduoin Bread (abud). After the hot ashes bake the bread, they need to be shaken off so you can eat it. Quite good, actually. Wadi Rum, Jordan. Jordan keeps trying to make sure we leave the country heavier than when we arrived - this tray is only for two people! 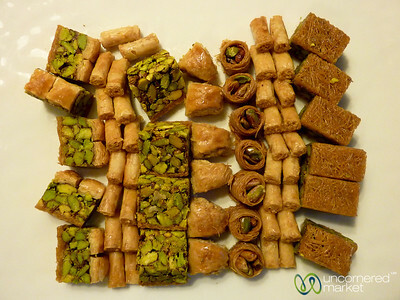 From left to right: Baklawa, Asabea, Mabrumeh, Asabea with Cashew, Ush Bulbul, Asabea, Burma. 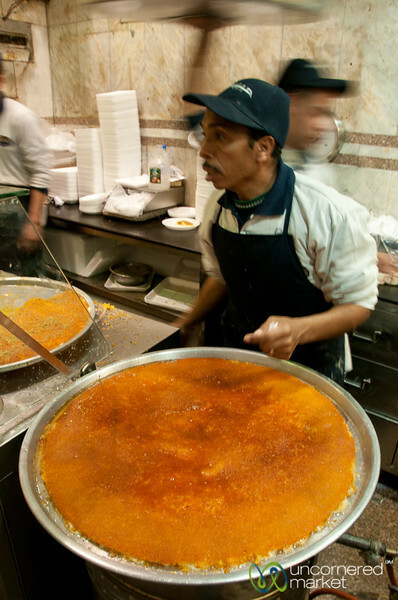 Knafeh is a Jordanian sweet made from a white cheese base with semolina bits baked on top and covered in sweet syrup. Very, very decadent. 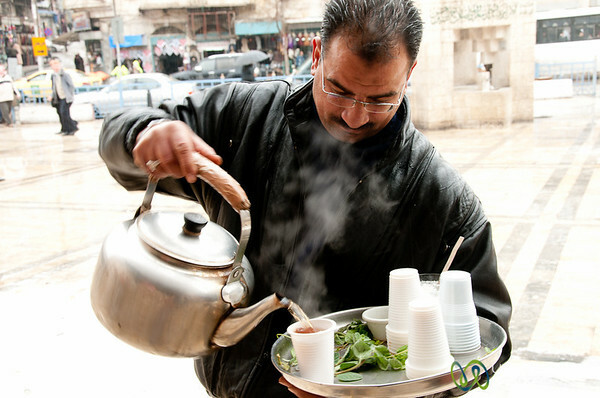 Taken at Habiba, a popular place in downtown Amman, Jordan. 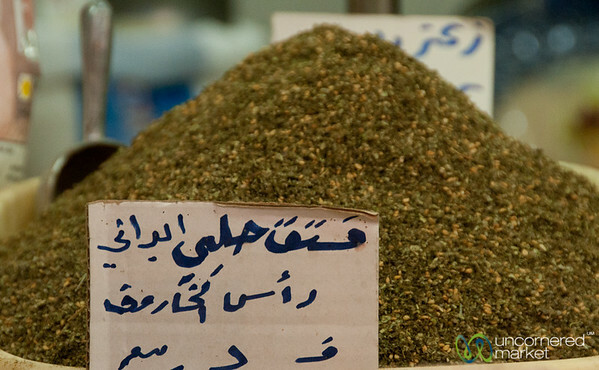 One of the common items on the breakfast table in Jordan is zatar, a mixture of dried thyme and sesame seeds. 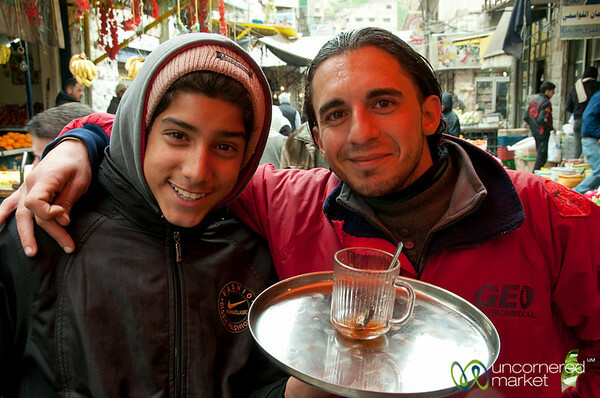 Here, you see it sold at the market behind Hussein Mosque in downtown Amman, Jordan. 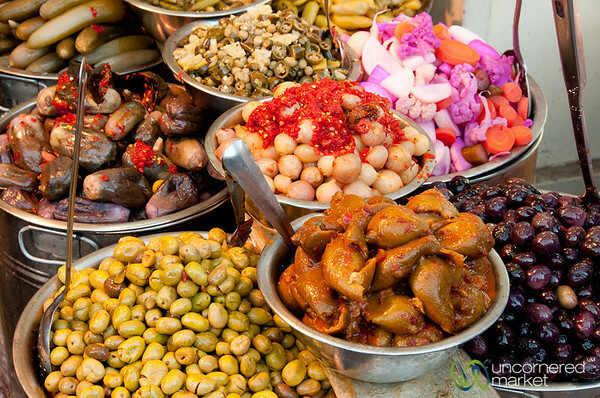 What we think of as a full meal, the Jordanians think of as starters. 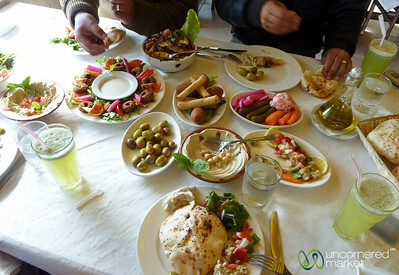 Here, you see the mezze (first course) of a typical lunch in Jerash, Jordan. Shaban grinds cardamom seeds into a fine powder with a mortar and pestle. This is an important ingredient for Arabic coffee. Wadi Rum, Jordan.